Weathering is the process by which rocks, minerals, wood, and many other natural or artificial things break down because of the natural world around us. Chemical weathering is the process of breaking down rocks using a chemical means, such as acids, bacteria, or enzymes. Weathering should not be confused with erosion. While both involve the changing of something from its original state, erosion is the process of removing parts of a material from its original location to another. Wind is constantly eroding rocks and mountains by blowing away small pieces of it over time to other places. Weathering, on the other hand, breaks down a material at its location and does not transport it somewhere else. The two can act in conjunction with weathering breaks down a material into smaller pieces and erosion removes those pieces elsewhere. Weathering exists in two forms. There is chemical weathering and physical weathering. Physical weathering, also known as mechanical weathering, is the breakdown of substances through direct contact with the physical world. For instance, when it becomes cold and water turns to ice, it will expand and displace its surrounding. A rock that has water on it might slowly break apart because the ice expanded and created cracks. The third form of weathering is biological weathering. This is essentially a hybrid of the two main weathering forms because biological weathering is weathering due to a biological factor. This can include the roots of trees displacing surrounding soil and rocks, which is a physical process, or enzymes breaking down something, which would be a chemical process. There are different types of chemical weathering that surround the changing of minerals into its components or into other minerals. The three main types are dissolution, oxidation, and hydrolysis. Dissolution is the easiest to see of the chemical weathering processes because it is the most common and obvious. It is the process of breaking down minerals, due to water, into their component parts. They dissolve because of the acid and chemical components in the water. Rainfall, which is acidic because of carbon dioxide in the air, has a pH of 5.6 in unpolluted environments. Gases such as sulfur dioxide or nitrogen dioxide can react with rainfalls and create pH levels of 4.5 or lower. Volcanic eruptions can add large amounts of sulfur dioxide into the atmosphere, which can interact with rainwater. As these acidic waters fall onto minerals, many of them break down because of the reaction between the acids and the minerals. Calcite will break down into calcium ions because of carbonic acid, which is produced during the interaction of rainwater and carbon dioxide. One of the most commonly seen dissolution is carbonation due to carbon dioxide. In limestone, which is rich in calcium carbonate, the carbonic acid, from the rainfall, reacts with the calcium carbonate in the limestone. This creates calcium bicarbonate. 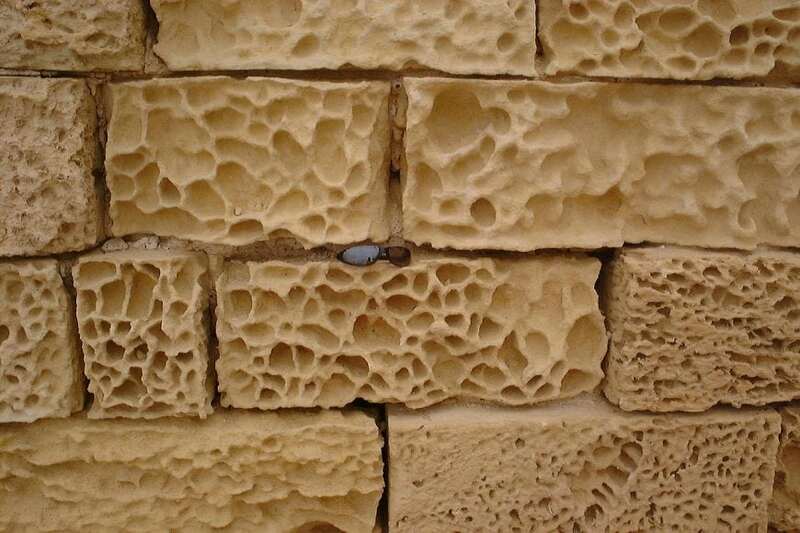 Limestone is slowly dissolved and becomes weathered overtime as this process continues. Carbonation, like many chemical weathering processes, is affected also by the temperature of the surrounding environment. As it gets colder, carbonation occurs more frequently because the cold water has more carbon dioxide in it. Oxidation is the second chemical weathering process that occurs in the presence of oxygen and water. The oxygen interacts with a substance, like metal, and creates an oxide. These oxides are generally weaker than the original compound so they tend to break apart. The oxidation of iron is the most commonly known of this weathering process. Iron-containing compounds, like olivine, are dissolved because of the acidic water. This creates dissolved iron and other compounds that interact with the oxygen and water to create a weaker mineralized form of iron, like hematite. This process produces discoloration, like brownish-reds, on the surface of the rocks that have undergone iron oxidation and gives us rust. Because this creates a weaker substance than the original, they are more brittle and will break easily. Hydrolysis is a weathering process that includes silicate and carbonate minerals and involves water. This is the process of a mineral becoming another mineral as the silicate reacts with pure water and becomes a new mineral. The most common of this process is the creation of clay from feldspar. For instance, potassium feldspar reacts with the water and hydrogen ions to create kaolinite (the clay) and some byproducts. Besides the main three forms of chemical weathering, there are others as well. Hydration is the process by which rocks and minerals will chemically absorb water until they reach a breaking point. This process increases the volume and pressure of the rock until it breaks apart because it cannot absorb any more. Biological weathering involving chemicals is also another process. Here, organic lifeforms interact with rocks and minerals to cause them to break down via a chemical means. 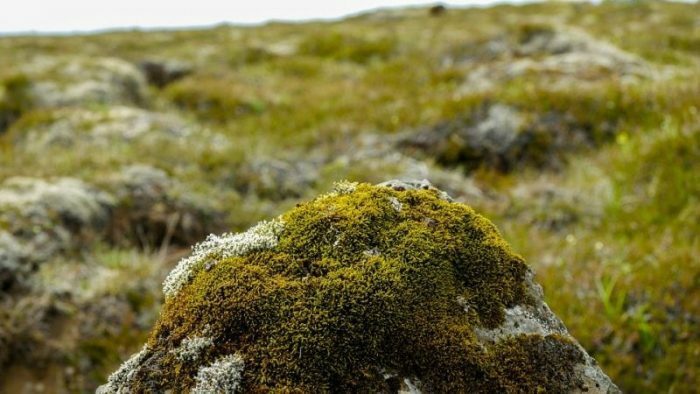 Lichen on rocks has been shown to accelerate the chemical weathering of rocks by 3X and even 4X in some instances. Other biological weathering via chemicals involve the release of organic acids from organisms to break down minerals and metals in soils. While these weathering processes are discussed separately of each other, many of them act in conjunction to accelerate the change of an environment. As rocks break down into smaller pieces, winds and water can carry those pieces all over the place. Physical weathering processes can expose more surface areas for acid rain to interact with, which would further accelerate the breakdown of rocks. Minerals and rocks that have become weakened due to oxidation are easily broken apart by the roots of trees as they grow and mechanically weather their surroundings. These processes have and will continue to shape our world as we also shape it through our own artifical weathering of things.